Is it just me or did this week seem to fly by? Now that I’ve put my outdoor projects to rest for a while, I thought I’d turn my focus to organizing our basement storage rooms. To me, it seemed like the perfect opportunity before our media room gets filled with new furniture and I’m left with little room to pull everything out, get rid of the drywall dust from our basement renovation, and put it all back a little more organized than it was in the first place. If you’ve lived through a renovation, you know that dust and debris gets everywhere. Although I covered as much stuff as possible with plastic, the mess that was left when the dust finally settled (sorry, couldn’t resist), was a just a little overwhelming. Although we still have a full day of work before our storage rooms are complete, I wanted to show you some of the progress we’ve made. 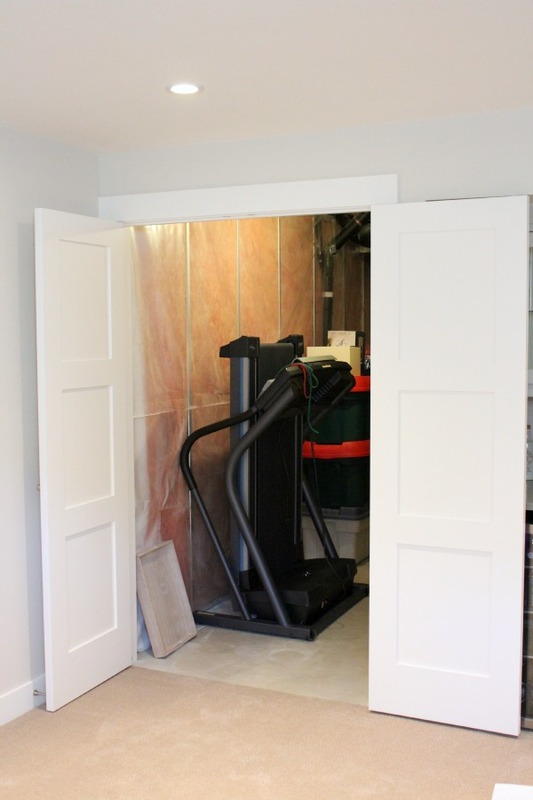 Remember those double shaker style doors we incorporated in to the basement design for ease of moving items in and out of the side room beside the stairs (predominantly the treadmill)? It’s one of the best decisions we made. It works very well to swing the doors wide open and easily retrieve our Christmas storage tubs or whatever else we’re needing at the time. It also prevents the narrow room from feeling too tight. Although I’ve tackled a bit of the work on my own, most of it was done with the help of my husband. He probably won’t like that I’m sharing this, but he is the vacuum king! I, on the other hand, would rather wipe things down and sort them out. It gives me the opportunity to purge and label, two things I have a strange passion for. When it comes to my own stuff, things can get a little more complicated. I often have a hard time understanding why we need boxes and boxes of golf balls, and he questions why I have so many old picture frames, glass vases, dishes, jars, candles, and more! Okay, so he does have a point. I made a rule for myself earlier this year to only buy items at garage sales, flea markets and thrift shops that I have an immediate purpose for. 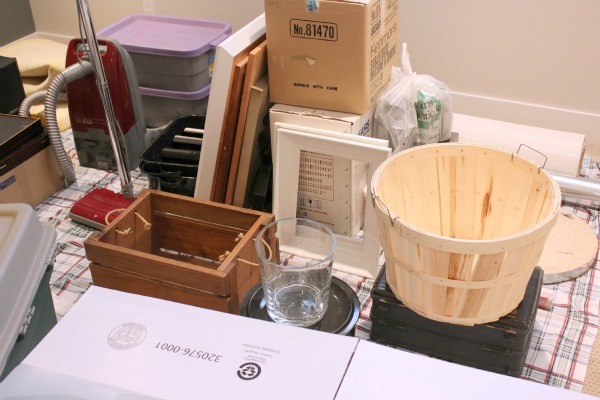 However, I didn’t realize how much stuff I had sitting in the corner of one of our storage rooms waiting to receive some TLC that I had collected prior to this self-imposed guideline. Notice the stack of frames that need to be painted and the two tubs with purple lids that have glassware and pottery in them? I tried to keep them buried as much as possible, but through this process my little secret was BUSTED! Is there anything you tend to gravitate to at second hand sales and have accumulated quite a bit of? For me it’s dishes and great pieces of furniture that just need a little elbow grease to make them fabulous. To be fair, I’m parting with a few items to keep our storage rooms uncluttered. My sense is that you’ll be seeing some of these thrift shop makeovers in the months to follow. « Decorated With Gold Yet? Too funny! I had the same thing happen when we went to move furniture around in our bedroom and my husband saw the boxes of fabric and other stuff I had picked up as bargains. I have since gotten rid of some of it, but fabric is something I become attached to. I have narrowed my fabric down to one tote. My husband doesn’t say too much about it since some of it he picked up for me when he was in India. What a great space to have! I am so jealous… not much storage in my new house! Yes, we are fortunate. 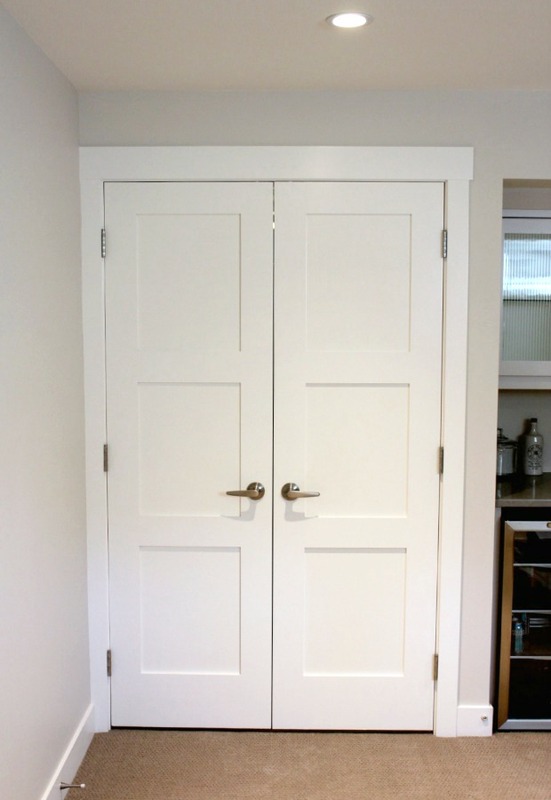 Hope you can find some good storage solutions for your new house. Perhaps vertical use of space in the garage or something like that. Your doors look great Shauna, I’m sooo Pinning that!! !